Hot, dry summer conditions puts incredible stress on turf plants. At a time when the golf course is in highest demand, the effects on turf quality can be disastrous. Syngenta Technical Manager, Dr Simon Watson, advises that pre-stress conditioning of turf and management techniques to alleviate stress can help to enhance the playing experience demanded by today's players this summer. Remember that on a sunny day the temperature within the short dense turf grass on greens, where air movement is limited, can reach up to 10°C higher than ambient air temperature, adding to turf stress. 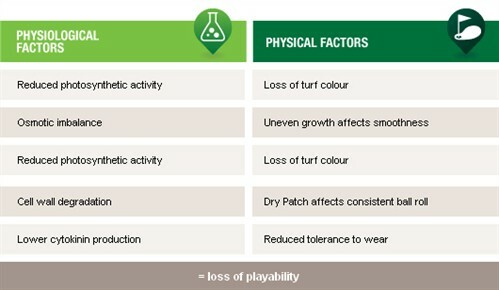 With smooth ball roll and consistent green surface quality key requirements for players' assessment of turf quality, minimising the effects of turf stress is essential to enhance the playing experience. The Syngenta Golf Player Survey identified dry and bare patches on greens and fairways as the greatest area of dissatisfaction among players. All cool season turf grass species are affected by heat and drought stress, but some turf species, including Bents and Poa annua, are especially susceptible. There is generally some varietal resistance, so over seeding with more tolerant grass species and varieties in situations where stress conditions occur most seasons, will help to minimise the effects. Stress can also make plants more susceptible to disease attack. In recent summers there has been an increasing incidence of anthracnose in dry conditions combined with undernourished turf. 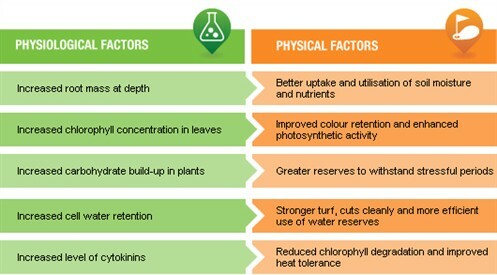 Healthy plants have greater natural resistance to disease and, with strongly growing turf, infected leaves will be mown off to remove disease that enables plants to recover quickly. However, with all the pressures from player and club demands, maintaining the balance of ITM measures is extremely difficult in a practical situation. In fact, some management practices and demands can increase stress on turf. Pre-stress conditioning with Primo Maxx aims to build up reserves within plants that enable them to better withstand stressful periods, and aides faster turf recovery when better conditions for plant growth return. Primo Maxx has the proven potential to increase root depth and mass. When used in a programme with the wetting and water conservation agent, Qualibra, the availability of soil water reserves held deeper and more evenly through the soil profile further encourages this more vigorous root growth and enhances the available water capacity of the root zone. Healthier plants, with deeper rooting, are a better able to seek out available soil moisture and nutrients, and stay green and healthy for longer, as well as recovering faster from drought effects or traffic and wear stress from heavy play. When should you start a Primo Maxx Programme? Primo Maxx programmes will give the best results in preventing the effects of heat and drought if a series of treatments are made before grass comes under stress. This will maintain healthy grass for longer and aide rapid recovery. Applications should start as soon as consistent grass growth commences - typically when soil temperatures are consistently 8 - 10°C or above, for more than five consecutive days. On fine turf surfaces most managers make the first application at a 50% reduced rate. Further application rates should be tailored to specific seasonal growing and weather conditions. It's a good idea to monitor the level of clippings removed to assess treatment timing; if grass is actively growing and clipping rates are increasing, further treatment should be applied. 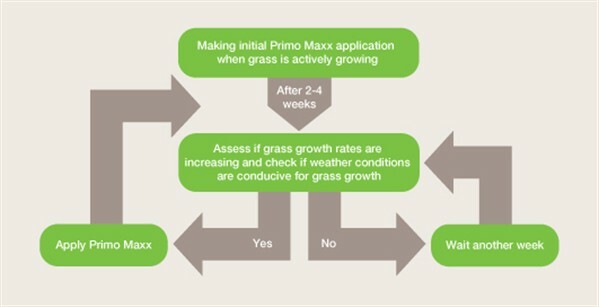 But if grass growth stops during extended dry periods, Primo Maxx application intervals may be extended until moisture and active growth returns. Do not apply Primo Maxx to turf that is already stressed. 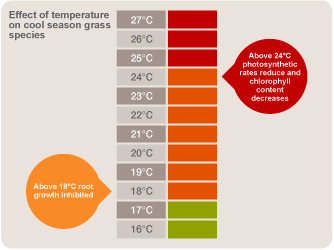 To help time Primo Maxx applications www.greencast.co.uk website has information on current soil temperatures and weather conditions.